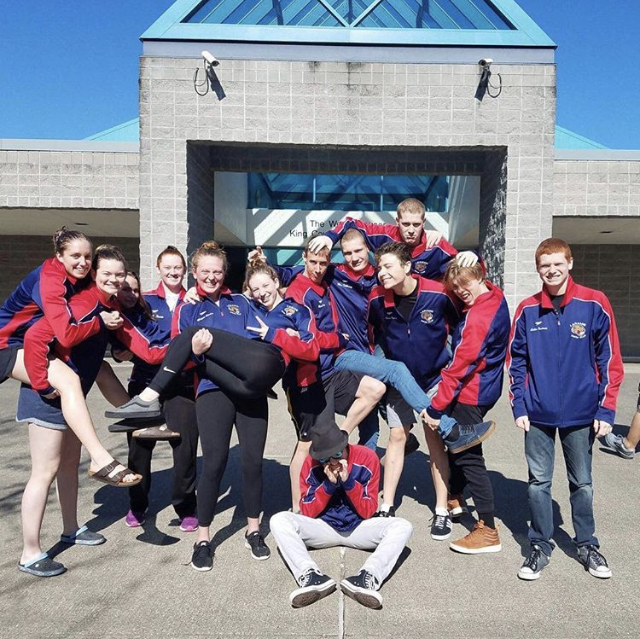 12 LHS students compete in swimming Sectionals on March 14-17 in Federal Way, Seattle, Washington. Sophomore Katie McPherson, Junior Olivia McPherson, Junior Max DeYoung, Junior Sage Morton, Matt Kelly (UW student) all qualified for the meet. Junior Rowan Kelly, Senior Conner Fontana, Senior Christopher Bury, Freshman Collin Fontana, Freshman Anna Roesler, Junior Sean Clerkin, Junior Madie Jablin attended Sectionals and participated in timed trials. All of the students were part of the Laramie Swim Club. The coaches for the swim team are Scott Cronk and Ryan Ball and the students started training in December. Morton broke two records at the Sectionals meet and DeYoung will be competing in Summer Junior Nationals and also broke his state record for the 50 free. Olivia McPherson competed in the 50 free, 100 free, 100 backstroke, 100 fly, 100 breaststroke, 200 IM (individual medley). There is a 6-event limit for the meet. “What made me start was swim lessons and just wanting to keep going…the team is really fun and being able to hang out and going to bigger meets is also really fun,” McPherson said. Laramie usually brings the most people to Sectionals out of all of the Wyoming schools. All 50 states compete in Sectionals and there are multiple Sectionals that are held around the nation. To qualify for sectionals, swimmers must make qualifying times at a meet during the year and they have the opportunity to qualify for the 2020 Sectionals at this year’s Sectionals meet. The top 36 swimmers at the meet will compete in the finals round. Unfortunately, the team was caught in Denver due to the snowstorm and their flight was canceled. As a result, they got separated due to rebooking and a few swimmers missed the first and second day of competition. “I would say overall, we did pretty well for that going on and not having been able to finish our last two practices,” McPherson said. In the summer, swimmers may have the opportunity to compete in Zones where swimmers from all around Wyoming compete together as a team. The next major event for swimming will be the High School State meet next year.